Celia Frost is a freak. At least that's what everyone thinks. Her life is ruled by a rare disorder that means she could bleed to death from the slightest cut, confining her to a gloomy bubble of safety". No friends. No fun. No life. But when a knife attack on Celia has unexpected consequences, her mum reacts strangely. Suddenly they're on the run. Why is her mum so scared? 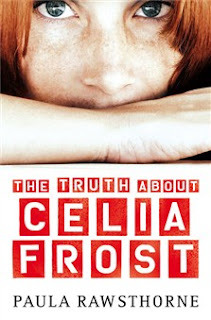 Someone out there knows - and when they find Celia, she's going to wish the truth was a lie - A buried secret; a gripping manhunt; a dangerous deceit: what is the truth about Celia Frost? A page-turning thriller that's impossible to put down. Paula's debut novel is absolutely amazing. I read this book in a matter of hours and loved every page. It is a cleverly sophisticated, fast paced and engaging thriller which had more twists and turns than you can shake a stick at. I was hooked from page one and couldn't bear to put it down as I needed to know what happened next. It was an utter pleasure to read and I can't wait to see what Paula writes next. Celia Frost is a young girl who has spent her entire life living in a bubble. She has been forbidden from doing all the kinds of things children and teenagers do like learn to swim or ride a bike or simply go out and make friends in case she injures herself. This is because she has been told if she cuts herself she could bleed to death. If this wasn't bad enough her mother has moved her from home to home from school to school for as long as she can remember making for quite a lonely existence for Celia. I loved Celia's voice in this book. I loved how she developed as a character as the book went on as she started to unravel her background and the reasons why her mum had treated her the way she did. I particularly liked the relationship she had with Sol, a boy of Celia's age who she meets when she moves house yet again to The Bluebell Estate. Another character I also liked was Frankie the ex-police force private investigator. I loved seeing how he got drawn in to something he wasn't fully comfortable in doing and how he struggled with the decisions he had to make. I won't say much more about the book as I don't want to spoil it for anyone else so I'll finish by saying that this book was definitely one of the best books I have read in a while. An engaging and totally absorbing read which is welcome change from all the paranormal and dystopian YA titles that seem to be everywhere at the moment. I would thoroughly recommend it. What a fantastic review- I will endeavour to push it up the pile - thank you again for getting a signed copy for me. very intriguing! I'll have to read it now to find out! This sounds really good and now I'm intrigued!